This is the final bracket. In a conference boasting the likes of Duke, Louisville,North Carolina and Syracuse, there’s one team that’s standing out above all those. The Virginia Cavaliers are one of the best teams in the country and looks to be the class of the ACC. With Virginia, it’s all about defense. Virginia’s pack line defense has befuddled foes ever since head coach arrived on campus. This year has been no different as Virginia is fifth nationally in defensive efficiency, second in field-goal percentage and second in points per game. That kind of defense keeps the Cavaliers competitive in every game and if they’re able to continue to do this all year, they might be on their way to the Final Four. Stock Up: Kentucky. This is the only team with better defensive numbers than Virginia. Kentucky’s size, length, athleticism and skill makes it the heavy favorite to win the national championship. Stock Down: Pac-12. I thought the league was on the cusp of a basketball renaissance, but it looks like its going to take a step back this season. If it weren’t for the surprisingly good season for Utah, the Pac-12 would really be in trouble. Stock Up: Wichita St. The Shockers clearly aren’t undefeated this year, but they’re still a real threat to go to the Final Four. They have one of the best backcourts in the country and can play with anybody. Stock Down: WAC. Quietly, the biggest loser in conference realignment. The WAC went from having teams like Utah, New Mexico and BYU to Grand Canyon, Utah Valley and Cal State Bakersfield. Even the MEAC has a better RPI as a conference. It’s good for games through 1/19/2015. It’s hard to do what John Calipari did in the previous three years at Kentucky. He’s taken extremely young teams, meshed them perfectly and had great seasons. People may have opinions about his tactics, but he’s found a way to work within the system. However, relying on freshmen and sophomores every year is going to produce some seasons like the one the Wildcats are currently experiencing. It’s hard to count on young players to give you consistency in effort and performance on a night-in night-out basis. It’s doubly hard in a year when the freshman class just isn’t that good nationally. Nerlens Noel was arguably the best freshman in the country but Archie Goodwin, Alex Poythress and Willie Cauley-Stein haven’t been what Calipari expected. People around the country are wondering what’s wrong with Kentucky. It’s just the natural progression of a young team. It’s tough for Big Blue Nation this season, but no one should shed a tear for Kentucky fans. They’ll be back. Stock Up: Memphis. The Tigers are making the most of their last season in Conference-USA. They’re dominating right now with an 11-0 record including a convincing 13-point win over second-place Southern Miss. They’re poised for a strong finish. Stock Down: Ohio St. Now I’m pretty confident that the Buckeyes are going to make the tournament. However their resume leaves a lot to be desired. You wouldn’t even be able to call Ohio St paper champions with the way its resume looks right now. Stock Up: Colorado St. New Mexico is in first place by a half game in the Mountain West, but Colorado St is turning heads out west. The Rams are following up on an outstanding year last year with another this year and looks prime for a solid seed in the Big Dance. Stock Down: The end of Bracketbusters. This was a great event for mid-majors to get a signature win and has directly led to some squads getting an at-large bid to the NCAA tournament. If George Mason doesn’t have the opportunity to beat Wichita St in Wichita in 2006 then the Patriots end up in the NIT and the Final Four. This bracket is good for games through 2/18. There’s a lot people can say about the way John Calipari has built his program at Kentucky. You can say he’s running a factory for pros. But right now, you can say he has the No. 1 team in the nation and a large part is because of freshman Anthony Davis. Davis, a likely first-team all-American and candidate for national player of the year is setting records for the Wildcats on the defensive end. Davis broke Shaquille O’Neal’s record for blocks by a SEC freshman and still has plenty of ball to come. Right now Davis has 127 blocks, which is a staggering number for anyone. The Wildcats’ great defense doesn’t end with Davis though. Fellow freshman Michael Kidd-Gilchrist may be the best overall defender on the team with other athletic guys like Terrance Jones and Doron Lamb who compete on that end of the floor as well. This is Calipari’s best team since he’s been at Kentucky. 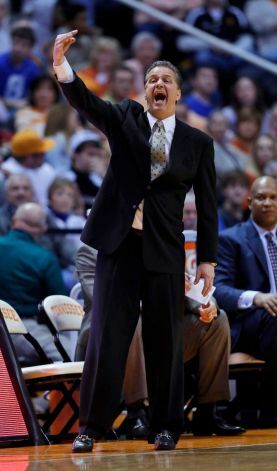 He may give Big Blue Nation the championship it so desperately craves. Stock Up: Wichita St. The entire country spent the first three months of the season praising Creighton and rightfully so. However, if you look at the Missouri Valley Conference standings now you’d see that it’s Wichita St that has a two-game lead on the rest of league. The Shockers went to Omaha on Saturday and dismantled the Blue Jays, sending a message to the country that they’ll be a force to be reckoned with in March. Stock Down: The leaders in the Horizon League. Valparaiso and Cleveland St are solid teams with some big non-conference wins. I have no faith that either one of these two will win the Horizon League tournament. Cleveland St lost two games last week and Valparaiso, who beat Cleveland St last week, lost it’s next game to Youngstown St. These two are showing me that they can’t handle success and with the fact that Butler is lurking doesn’t bode well for the Horizon leaders. Stock Up: Michigan St. Tom Izzo is at it again. His team went into Columbus and beat Ohio St. Izzo, in my opinion, is the best coach in the country and he has a team with chemistry this year. An Izzo team that has talent and chemistry can do a lot of damage down the stretch. Stock Down: Pitt. I praised the Panthers last week, but they promptly went out and lost two games – effectively ending any hopes of an at-large bid. They need to string a bunch of wins together and last week wasn’t just a speed bump, it was a mountain. The Panthers will have to win the Big East tournament to get a bid. Strength: The Buckeyes are one of most balanced teams in America. Led by all-everything freshman Jared Sullinger, the Buckeyes can score in anyway imaginable. Sullinger demands double-teams in the post, but that allows him to kick out to open shooters on the perimeter and they’re knocking their shots down. This is one of the favorites to win the national championship and it’s because they can do everything. Weakness: Ohio State may be a great team, but its not a very deep one. The Buckeyes have four guys who play over 30 minutes and that’s a lot. That will be difficult to manage in a tournament situation with a short turnaround. This is a great team, so in all honesty, it may be able to overcome the depth issue. However, if the Buckeyes lose, this could very well be the reason why. Strength: Though he’s just a freshman, Kendall Marshall has completely changed the make up of the Tarheel squad. Marshall is a true point guard and has run this team like a seasoned vet. His play has sparked the confidence of his teammates, especially fellow freshman Harrison Barnes, who is playing the best basketball of the season. If Marshall keeps playing well, this North Carolina team can realistically dream about the Final Four. Weakness: There are still worries about the youth of this team. Coach Roy Williams is leaning on a lot of underclassmen to be successful. Barnes, Marshall and sophomore John Henson are talented players, but not very experienced. This will be the first NCAA Tournament experience for them all so its unknown how they’ll handle the big stage. If they can’t handle it, the Tarheels will have a problem getting out of the first weekend. Strength: The Syracuse 2-3 zone is the best in the country. Jim Boeheim has perfected the zone and he has the right personnel to play it well. With Rick Jackson, the Big East Player of the Year, anchoring the back of the defense; the Syracuse zone is almost impenetrable on the interior. Syracuse, then has the length and quickness on the wing and perimeter to challenge outside shots. The zone is a thing of beauty and in a tournament scenario, it is difficult to prepare for. Weakness: For Syracuse to be successful, it must get steady play from the point guard position. Scoop Jardine can hit tough shots and make big plays because he’s a risk taker. Jardine can also kill Syracuse’s chances because he’s a risk taker. If Jardine is playing well, he can be one of the great point guards in college basketball, but when he’s not the Orange is a very average basketball team. Average doesn’t win games in the NCAA Tournament. Strength: This is an explosive team. The Wildcats put up points in bunches. Brandon Knight, Terrence Jones and Doron Lamb may only be freshmen, but they can put up points in a hurry. Knight is finally settling into his role as point guard and Jones is an absolute nightmare with his versatility. This team is super talented and if it makes jump shots it has a legitimate shot at the Final Four. Weakness: Kentucky’s youth will be severely tested in the NCAA Tournament. There’s always a risk when a team relies so heavily on underclassmen, even if those underclassmen are as good as Knight, Jones and Lamb. Last season, you saw a team not adjust to the defense West Virginia played and panicked by shooting a lot of ill-advised threes. Kentucky has to show more poise this year. Strength: As with all Bob Huggins-coached teams, this year’s edition of the Mountaineers is tough as nails. They rebound the basketball well as they finished second in the conference in offensive rebounds and offensive-rebound percentage. They also play tough, in your face defense as they only allow their opponents to shoot 40.9 percent from the field. Any team with desires to defeat West Virginia better know it’s in for a fight for 40 minutes. Weakness: West Virginia has some awful offensive numbers. The Mountaineers have to be a great offensive rebounding team out of necessity, because they struggle to score. West Virginia is 12th in the Big East in field-goal percentage and 11th in three-point field-goal percentage. Outside of Casey Mitchell, no one on this team is capable of going for 25-plus so if this team meets its match on the boards, it could have a short stay in the tournament. Strength: The Musketeers have a team with great balance. The Atlantic-10 Player of the Year, Tu Holloway leads the Musketeers, but they’re not a one-trick pony. Xavier has Mark Lyons to complement Holloway in the backcourt while Jamel McLean and Kenny Grease are a load to handle in the post. That balance makes the Musketeers difficult to guard and gives them an excellent chance to advance in the tournament. Weakness: Xavier has a very short bench. The Musketeers really only have a seven-man rotation and the two reserves don’t provide much more than a brief respite for Xavier’s starters. Xavier has a talented starting five, but it’s not talented enough to overcome foul trouble or an opponent that likes to employ pressure defense. For Xavier to make a run, it’ll need a contribution from an unexpected source. Strength: Not many teams can score with the Huskies. Washington has one of the best point guards in America in Isaiah Thomas. Thomas loves to play in transition and that’s where Washington is at its best. The Huskies are third nationally scoring 83.5 points per game and they do it on 47 percent shooting. The Huskies have talent and are hard to guard. This is a dangerous team. Weakness: This is a team that gives games away. The Huskies are one of the worst free-throw shooting teams in the Pac-10 at 66.7 percent. The fact of the matter is that Thomas, while not the worst shooter, should be shooting a much higher percentage than 70.6 percent as the point guard of the team. Matthew Bryan-Amaning, the team’s second-leading scorer and best low-post presence shoots just 61.4 percent. The Huskies struggles at the line could cost them postseason success. Strength: George Mason is one of the most efficient offensive teams on the mid-major level. The Patriots lead the CAA in assist-to-turnover ratio, field-goal percentage and three-point field-goal percentage. That efficiency led to a 15-game winning streak and a dominant season in one of the best mid-major conferences in America. They pass the ball well and have several guys who can score. George Mason will be hard to guard in the Big Dance. Weakness: Any team that can’t be trusted at the free-throw line can’t be trusted in the Big Dance. George Mason is eighth in the CAA in free-throw percentage at 69 percent. There aren’t a lot of weaknesses in the Mason attack, but this could potentially be a major one. If the Patriots don’t knock down shots from the charity stripe, they could have a short stay in the tournament. Strength: Villanova has one of the best backcourts in the country. When Corey Fisher, Maalik Wayns and Corey Stokes are playing well, this is a very difficult team to beat. They’re tough in transition and you must respect their jumpers. These guys are explosive and if they all get going they can make a serious run in the tournament. Coach Jay Wright loves guard-laden teams and he has one that can do some damage. Weakness: Team chemistry was an issue last season for the Wildcats and it appears to be a problem again. Villanova’s late-season slide went from troubling to embarrassing. The lost to South Florida in the Big East tournament was a bad sign reminding everyone of what happened to the team last season. Villanova barely beat Robert Morris in the first round last season before flaming out against St. Mary’s. It looks quite possible that the Wildcats could be one and done this year. Strength: Georgia is one of the most athletic teams in America. Led by the high-flying Travis Leslie, the Bulldogs are an exciting team in transition. Their athleticism also helps them defend as well. Georgia holds its opponents to just 39.6 percent shooting from the field. Georgia has the kind of athleticism teams just can’t simulate and that’s what will make it a match-up nightmare in March. Weakness: Georgia’s five starters are as good as any in America, but after that there’s a tremendous drop-off. The Bulldogs’ bench production is minuscule. They only get 9.8 points per game from it’s bench. That’s not good enough. Some teams in America get that much from one reserve, let alone, all of them. Foul trouble or fatigue could doom the Bulldogs to a quick exit in the Big Dance. Strength: There aren’t many teams in the country with the versatility Marquette enjoys. The Golden Eagles have several players that can play multiple positions and can do multiple things. Jimmy Butler can play three positions, Vander Blue and Darius Johnson-Odom can play both guard spots while Jae Crowder is tough enough to play all three frontcourt positions. This team has interchangeable parts and loves to throw different lineups at its opponents. It’s the way the Golden Eagles keep their opponents off-balance on their way to 20 wins. Weakness: Marquette is usually a perimter-oriented ball club and this year that’s still the case. The only problem with that is it leaves the Golden Eagles soft on the interior. Marquette is in the bottom half of the Big East in rebounding, but what’s worse is it still struggles to defend quality low-post scorers. If Marquette is to make a run, it’ll eventually play a team with a competent scorer in the frontcourt and if Marquette can’t defend then it can’t win. Strength: Despite a slight change in its style of play, Clemson is still one of the ACC leaders in forcing turnovers. Under former head coach Oliver Purnell, the Tigers applied full-court pressure for 40 minutes, but under current coach Brad Brownell, they’ve decided to play in the half court more. Despite that, they’ve still been able to use their athletes to play outstanding defense. That defense could win Clemson a game or two in the Big Dance. Weakness: Clemson is not the most efficient team offensively. The Tigers are ninth in the ACC in scoring, seventh in free-throw and field-goal percentage, and eighth in assist-to-turnover ratio. Those are just ugly numbers for a team that managed to have a winning record in the league. The problem for Clemson is there will be no Wake Forest, Georgia Tech or Virginia in the Big Dance. That kind of inefficiency just won’t cut it. Strength: Coach Mike Davis has turned his UAB squad into one of the best defensive teams in Conference-USA. The Blazers are third in the conference in field-goal percentage defense, only allowing 41 percent shooting from their opponents. That helps them hold opponents to a little over 62 points per game. Davis is a tough, in-your-face kind of coach and his team has taken on his personality. Weakness: UAB’s surprising inclusion into this year’s field is partly because of how ordinary its been offensively. The Blazers have offensive numbers that are average in Conference-USA so that should tell you how pedestrian they’ve been on offense. This is a team that scores in the 60’s routinely and sometimes struggle to even hit that mark. At just 44 percent shooting, the Blazers may not have the chops to do much damage in the tournament. Strength: Everyone knows what the strength of Princeton is. It’s the Princeton offense. No matter how many times you watch the Tigers play, their offense is always difficult to defend. It takes patience and concentration to defend for a full 35 seconds, but that’s what that offense makes teams do. Teams have to guard against three pointers and backdoor cuts. It’s the offense perfected by the Tigers, who can definitely spring an upset using it. Weakness: Princeton is a team that relies heavily on its starters. The Tigers like the control the pace of the game and that allows their starters to play a lot of minutes without going in the tank, but they’ll be facing competition that’s a couple steps up in the talent department. Princeton’s opponents will force it out of its comfort zone. Will Princeton’s starters be able to handle that? Strength: Just like most other Missouri Valley Conference teams, the Sycamores will lock you down defensively. Indiana St is No. 1 in the MVC in field-goal percentage defense, holding its opponents to 40.3 percent on the year. In addition to that, Indiana St. is No. 1 in blocks and No. 2 steals in the conference as well. None of the Sycamores opponents in the MVC Tournament scored more than 56 and that’s what makes this team dangerous. Weakness: With only one starter at 6’8 and not a lot of quality frontcourt guys on the bench, the Sycamores can be exposed inside. Indiana St has been an average rebounding team on the year and it’s low-post scoring has been minuscule. When possessions are placed at a premium in the tournament, Indiana St is going to wish it had someone it could dump the ball to in the paint. Strength: Long Island has a difficult style of play to prepare for as they like to play in the open court for 40 minutes. The Blackbirds are sixth in the nation in scoring at 82.6 points per game. They want to impose their will on their opponent and induce them into playing at their pace. This team can score and run and can pose serious trouble for a team in the Big Dance. Weakness: Due to their pace, Long Island can keep teams in games with their turnover problem. The Blackbirds have a negative turnover margin and assist-to-turnover ratio. Any team it faces in the tournament will be talented enough to exploit their turnovers. If they want to have any success in the tournament, they’ll have to cut down on the miscues or it’ll be one-and-done. Strength: The Roadrunners force teams into a lot of misses. UTSA finished second in the Southland Conference in field-goal percentage defense. The Roadrunners also force over 14 turnovers per game with over half of those coming on steals. The Roadrunners defense led them to a surprising run in the Southland Conference Tournament and it could also lead them to a win in Dayton. Weakness: UTSA is a team that relies heavily on three players. Devin Gibson, Melvin Johnson and Jeromie Hill are all outstanding players, but they can’t be what the entire team leans on. If one of them has a bad game, it could be disastrous for the Roadrunners. All three of them have to be great for UTSA to have any chance. If just one of them is off, it’ll ruin the Roadrunners’ hopes. Strength: The best defensive team in the SWAC; Alabama St holds its opponents to just 40.3 percent shooting on the year. That helped Alabama St through their conference tournament where they held their opponents to an average of 58.3 points per game. The Hornets will be looking to carry that defense into Dayton where they have a realistic shot at getting the schools first NCAA Tournament victory. Weakness: The Hornets struggles on offense have forced it to defend well. Alabama St only scores 61.3 points per game, 2.3 points less than what they yield on the season. That’s why the Hornets had a sub-.500 record against Division I opponents and have to play the opening round game in Dayton. If the Hornets can’t put points on the board, it won’t matter who they play because they’ll be going home.